My name is Donna, and I'm a TV addict. Seriously. I'd like to think I'm semi-recovering, since I no longer have two shows per day that I MUST WATCH NO MATTER WHAT. (I'm down to like one per day, and that's only during the September-December, January-May period. And I'm totally normal during re-runs.) And I used to completely freak if someone attempted to talk to me when it wasn't a commercial. The phone would ring and I'd be all, "Um hey Buffy's on canIcallyoubacklater?" I'm totally chill now...ahem, thanks to DVR and pausing live TV. I'm a pretty particular type of TV addict, though. I rarely watch a show for the sake of watching it. Of course, I'll sit down for the random HGTV show or the always-engrossing E! True Hollywood Story, but I have too much going on to waste my time on non-obsessions. And I've seen every single Friends episode fifteen times and I'm never tired of them. But what is it about a show that hooks me? It's the same thing, I realized, as what makes me love a book. Primarily, it's the characters and dialogue. And I'm an utter sucker for a juicy romance. Do I enjoy the random episode of Law & Order? Yeah. But I can walk away. So what shows can I watch over and over? ~ Buffy the Vampire Slayer -- FANTASTIC through the end of season 3, still great through the end of season 5 (when it should've stayed ended). Some of the best teen dialogue out there. ~ Alias -- At least until the third season, when JJ decided to turn a fantastic spy show into a prophecy-ridden mess of identity issues. 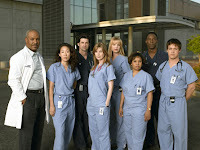 ~ Grey's Anatomy -- I didn't study for my science final in colle ge because I couldn't stop watching the end of season 1 on DVD. nuff said. Hoping it regains some former glory this season. ~ Lost -- JJ, I'm trusting you not to lead me astray this time. I'm investing years of my life in this! ~ Scrubs -- Too absurdly funny not to love. 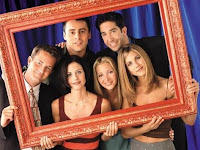 ~ Friends -- My ideal comedy. I will quote it to the death. I loved the seasons when the jokes became character-centric and not just one-liners. ~ My So-Called Life -- Only the good die young. If you never saw it, it's out on DVD! ~ Desperate Housewives -- Really well written. Not enough people appreciate the quality behind the fluff. ~ Castle -- Smart, snarky, totally fun, with great chemistry. And it's about a writer! ~ Dollhouse -- I heart Joss Whedon. ~ Samantha Who -- Really really funny. So bummed it's cancelled! Alright, here's your chance to agree...or argue! Do I love something you think is terrible? What did I forget to include? Comment away! PS - A semi-inspiration for this post came from Janice Hardy, over at The Other Side of the Story. She gets you thinking! I love Samantha Who? it's hilarious! My So Called Life and Buffy Seasons 1-3 FTW!!! Grey's was AMAZING season 1 and 2, but I'll never forgive the writers for the cracked out way they dealt with season 3 and I never even bothered with season 4 and 5!!! I get to passionate about this, but seriously season 3, George's dad's cancer needed to drag on and he should've died during the season finale. And on top of one intern's parents death, we had Meredith's mom die, and then her step mom die-how many times can this storyline repeat itself in one season! UGH! Now I'm fired up! I totally agree, Donna! For me, I need the trifecta (I guess I have high standards?) of character/dialogue/intrigue--for a half-hour show, I only need two of the three--case in point: i LOVE The Office and 30 Rock. Intrigue? Not so much. But the character and dialogue is so outstanding, you don't need anything else. For the hour-long shows, though, I need the intrigue, so my favorite shows include House, Bones, Heroes (though I'm getting dubious), Chuck, etc. And all I need is a grizzly murder scene and I'm sucked into an episode of Law & Order, NCIS, Numb3rs... And let's not forget, my five year obsession with The X-Files. Oh, My So-Called Life. A single tear just worked it's way down my cheek. I love that show. I love Jordan Catalano and I love Brian Krakow. Ugh, I miss that show. And I loved Samantha Who too. And Lost. And True Blood. And Gossip Girl. And Friday Night Lights. And Big Love. And pretty much anything with teenagers and a plot. Oh and anything that Bravo craps out. My standards are really low. Omg, I forgot about Gossip Girl! I've only watched part of the first season, but I think I might be (shamefully) in love. Great post, Donna. 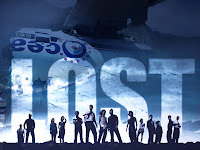 I rarely watch TV anymore... except for LOST. I'm totally obsessed. Can't stand waiting until late January for the final season. I used to watch too much TV, which is one of the reasons I never got any writing done. Roswell was one of my favorites. And I own all the Roswell High books which were also cool and should still be in print. But My So-Called Life was the best. The writing, the acting, the characters. We can all learn from that one wonderful season. As for comedies, do any of you remember Brother's Keeper? Another show that should have lasted longer than one season. I don't remember Brother's Keeper at all. Thanks for all the comments guys! Oh, and I ought to mention -- some shows now that I think I'll really love, I just wait until they're cancelled or end and are out on DVD. That way, they take over my life for like a month as I watch them all back to back, but then I'm DONE! It just feels less time-consuming in the long run.